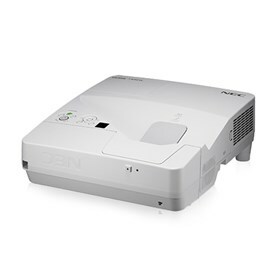 The NEC NP-UM352W is a 3500-lumen ultra short throw projector that comes with with built-in whiteboarding and advanced collaboration capabilities. A complete interactive projector solution can be created using the automatic calibration that takes less than 20 seconds. The horizontal and vertical keystone adjustment or cornerstone correction ensures the image will fill the screen every time. The NP-UM352W includes a powerful 20W speaker, closed captioning and RJ-45 for remote management over a network. Its input panel includes dual HDMI, VGA and a microphone input to amplify the presenter’s voice. The projector has variable audio out, carbon savings meter, virtual remote, sleep timer and microphone input. It also features USB viewer, advanced accublend, autosense and autosense. The NEC NP-UM352W has many exciting features for users of all types. See the NEC NP-UM352W gallery images above for more product views. The NEC NP-UM352W is sold as a Brand New Unopened Item.